Is it me or have pineapples been popping up everywhere lately!? They most certainly are in this season and I am all about it! I have always loved what they represent - friendship and welcome - and love the idea of incorporating them into my everyday life and style. They are just too cute! I wanted to share some of my favorite pineapple-inspired items with you all so I rounded them up. I seriously would like one of each! Dolce & Gabbana has been all about the pink pineapple print this season and it's to die for. How perfect is this pink pineapple card case!? A bit of a splurge but a girl can dream, right? 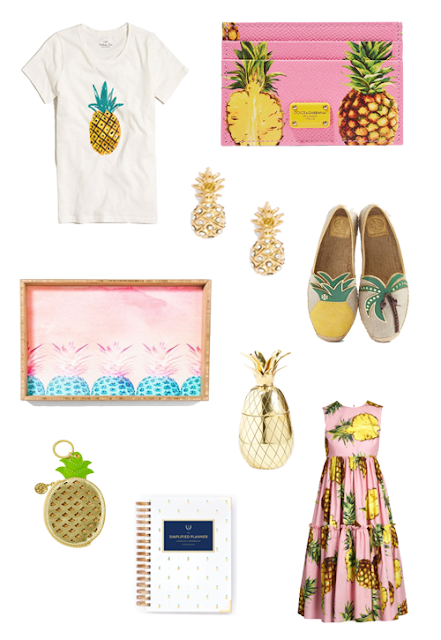 To shop the rest of these pineapple beauties, check out the links below!